Newly signed striker Nicholas Kipkirui is proving to be an adept scorer with his ability to time his runs into the box perfectly and his ability in the air. 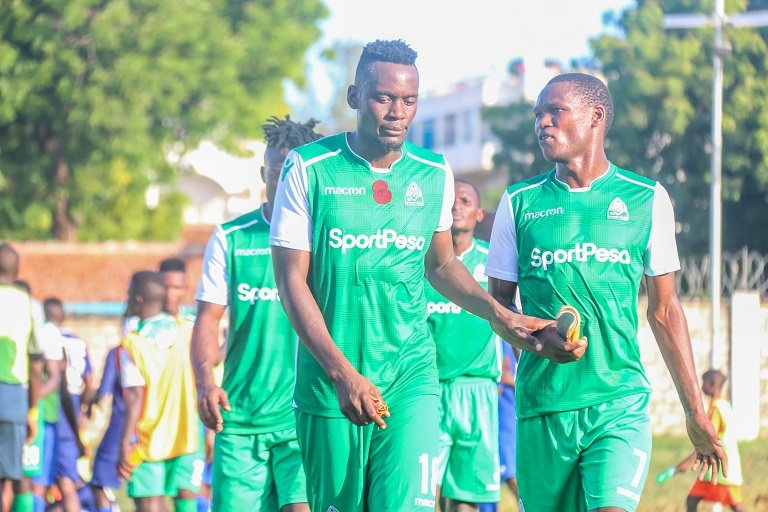 The players should be well rested for this weekend’s mashemeji derby as Gor Mahia will be looking to continue to climb up the league title after a poor start. If GM has only 274 paying members then why has EC never employed police to arrest hooligans who cost GM millions in fines, who allows “free” entry ain’t it the stewards employed by the same EC. This is designed chaos whose beneficiaries are Mugabe & co.
Jamigori, as an aspiring chairman, how will you deal with “GM’s huge OPAQUE debts” that you will inherit especially the kes.129 KRA bill. When AR & Ngala assumed office GM had no tax bill so how/why did it balloon to kes.129m during the last 10 years. @Oduor12, I am not aspiring to be the chairman of Gor Mahia but I am proposing a radical change in managing the club and turning its fortunes around. We have a great club and I can help the club to raise Kshs.500 million by just working on minimal measures. Because Gor Mahia has consistently been the top best teams in Kenya and East African region and often qualifies for CAF Championship League, I think there must be a strong competition among companies willing to sponsor Gor Mahia if the team is packaged and structured well from the current community club. The team should also effectively leverages this competition of sponsors by finding the best deals for sponsorship of its soccer activities. Transformation of Gor Mahia must begin by addressing re-packaging of the image of club by hiring a credible PR and marketing firms as well as looking at the ownership structure of the club from the current old structure of a society based to modern incorporation of a limited company where the limited company can issue shares to either limited members of the public or by invitation of the public to participate in share subscriptions. The transformation of football teams have been done all over the world and the current EC officials do not need to reinvent a new wheel. Gor Mahia should have elaborate plan to develop and build its own stadium. The stadium should come with floodlighting, hence permitting evening matches, and have a long term project to cover the stands with roofs. The long term plan is to convert the stadium into an all-seater capacity to host even high profile matches. The stadia should be develop with plans of expanding the seating capacity throughout the stadium in future. WHAT ARE GOR MAHIA LARGEST REVENUE SOURCES? The largest sources of revenue for Gor Mahia should come from sponsorship agreements, commercial trading, broadcasting and matchday ticket sales revenue. Gor Mahia should derive the largest share of its revenue by monetizing its huge brand and fan base through sponsorship relationships. The team must develop a segmentation sponsorship strategy with regional, domestic and product-specific segments. Among the team’s two sponsors are well-known companies notably Sportpesa and Macron. We can expand this to include other companies if only the corporate image of the club is structured to meet the required threshold. Sponsorship revenue can also be derived from placing sponsors’ corporate logos on the team’s shirts, merchandises and training kits. Over the last 3 years or more, Sportpesa has been the primary sponsor of Gor Mahia’s shirt sponsors as well as sponsoring the training kit. We need to engage Macron which is our supplier and manufacturer of jerseys for a long term commercial contract. Another important source of revenue for Gor Mahia should be derived from matchdays, which are all domestic, regional and African football matchday activities. Matchday revenues should mainly come from admission tickets/season tickets, sale of food and drinks and event parking. Games at home ground should boast one of the highest utilization rates in the Kenya Premier Leagues and in Africa. The other largest source of revenue should come from broadcasting deals Gor Mahia and KPL signs with TV paying stations, Internet and cable companies, such as the Multichoice or Super sports companies, as well as having our own proprietary TV channel, GorTV. Because success on the field and the number of games played in the Kenya Premier League, FKF Cup and other friendly and CAF leagues can determine the size of our audience watching games, Gor Mahia’s broadcasting revenue will not be constant but will fluctuate year over year. For example, when Gor Mahia does not win the Kenya Premier League and showed a lackluster results in other competitions, our broadcasting revenue will too fluctuate. From everything mentioned above, Gor Mahia should aim to become CAF champion within the next three year of strategic plan, become the most successful club in Africa, increase profile of the number of young players, the ratings (live and TV broadcasting) continue to grow, and sponsors becoming more generous with more sponsorships on board. The synergy of local community, fans and great companies will always help to create more support for the club. We must aim to operate and manage the club’s business as a single reporting segment – the operation of a professional sports team. Gor Mahia board and management should review the club’s revenue through three principal sectors – commercial, broadcasting and matchday. 1. Board of Management – Developing strategies and playing oversight role headed by a chairman with seven seasoned board members appointed from the corporate world. 2. Executive Management (EXCOM)- to be headed by the Chief Executive Office with the support of Finance & Commercial Director, Football Director, Contracts and Legal Director, Marketing Membership and PR Director and Audit Director. The Excom will be responsible for the implementation of the strategies from the board. Within the Commercial revenue sector, Board and Excom should monetize the rich club regional and domestic brand as well as wide fan base via three revenue streams notably: sponsorship; retail, merchandising, apparel & product licensing; and mobile & content. a)	Sponsorship: We should monetize the value of regional and domestic brand as well as community of fan base and followers through marketing and sponsorship relationships with leading local and regional companies around the region. To better leverage the strength of our brand and fan base, we must immediately develop a regional, domestic and product segmentation sponsorship strategies. b)	Retail, Merchandising, Apparel & Product Licensing: We should aim to market and sell all Gor Mahia branded sports apparel, training and leisure wear and other clothing featuring the Gor Mahia brand. In addition, we should also aim to sell other licensed products, from coffee mugs to bed spreads, featuring the Gor Mahia brand and trademarks. These products must be distributed through Gor Mahia branded retail outlets and e-commerce platforms, as well as Gor Mahia appointed partners’ retail and wholesale distribution channels locally and in the region. As a test run, Gor Mahia can do a market read and survey for all its retail, merchandising, apparel & product licensing business by appointing leading outlets and thereafter developed a branded outlets in all major cities. Gor Mahia should hugely benefit from the distribution of live football content directly from the revenue it receives and indirectly through increased regional exposure for its commercial partners. Broadcasting revenue will be derived from the television rights relating to the Kenya Premier League, CAF competitions and other competitions. In addition, Gor Mahia wholly-owned television channel, GorTV should be establish to delivers Gor Mahia programming to several territories around the region. Broadcasting revenue including, in some cases, prize money received by the club in respect of various competitions, will vary from year to year as a result of variability in the amount of available prize money and the performance of our first team in such competitions. Gor Mahia through the Marketing and PR should aim to increase matchday attendance through various publicity mechanisms and channels. The club must have a target of average attendance of over 60% of attendance capacity for our Premier League matches in the next 5 years. However, the matchday revenue expected to vary from year to year as a result of the number of home games played and performance of first team in various competitions. The club will also sell season tickets at discounted prices to only registered members of the club. In order to maximize the matchday revenue collections, the club may outsource the service external platform operators and may also use technology for better payment and collection systems to minimize the pilferages of the revenue. Gor Mahia is well-positioned to continue securing several sponsorships with leading brands. With Sportpesa as the main shirt sponsor, Gor Mahia should implement a proactive approach to identifying, securing and supporting new sponsors. Gor Mahia should consider domestic, regional and continental sponsorship partnerships as well as financial services partnership. In addition to developing the club sponsorship portfolio, Gor Mahia should focus on segmenting new opportunities by product category and territory. As part of this strategy, Gor Mahia should open new outlets in all major cities in Kenya and in the region. Currently, Gor Mahia need to have long term agreement with Macron with respect to its technical sponsorship and dual-branded licensing rights, which began on 2018. The agreement with Macron should not include the rights with respect to mono-branded licensing rights or the right to create and operate Gor Mahia branded youth academy, physical retail channels and e-commerce retail channels. These are business areas that must be managed by the club to provide Gor Mahia with increased commercial opportunities and control. In the future, Gor Mahia should plan to invest to expand its portfolio of product licensees to enhance the range of product offerings available to club followers. Additionally, Gor Mahia may also seek to refine how to segment the different elements of this business. The club may also increase its focus on developing these rights more proactively, alone or with other partners. The rapid shift of media consumption towards internet, mobile and social media platforms presents Gor Mahia with multiple growth opportunities and new revenue streams. The club need to develop its digital media platforms, such as mobile sites, applications and social media, which are expected to become one of the primary methods by which the club engages and transacts with its followers. The club must continue to evolve its media team’s capability to address these opportunities. Immediate action is to have a club TV channel and this action will also help to ensure that the club has both a greater degree of control over the production, distribution and quality of its proprietary content and better insight into how to evolve its mobile & content strategy as the club continue to develop and roll out carefully targeted new products and services. In addition to developing the club’s digital properties, Gor Mahia should make an intention to leverage third party media platforms and other social media as a means of further engaging with its followers and creating a source of traffic for its digital media assets. The club’s mobile & content offerings should at this early stage be developed and this will present opportunities for future growth opportunities. Customer Relationship Management (CRM) is critical for success and I believe that the club has this opportunity to further leverage on its rich customer base through the CRM database, which should include CRM records, its Facebook connections, Twitter connections and Instagram account followers. Gor Mahia must plan to implement a carefully considered strategy to target these individuals as part of its overall digital media rollout plan and in 2020 plan to launch GorTV app and YouTube in the country and across the region. All friendly matches and tour games should be streamed live on these platforms. Gor Mahia is well-positioned to benefit from the increased value and the growth in distribution associated with the Kenya Premier League, CAF Champions League and other competitions. Since love and interest in football is fast growing, I believe this affirms the expected increase demand for live sports and football in particular. Unlike other television programming, the unpredictable outcomes of live sports will ensures that individuals consume sports programming in real time and in full, resulting in higher audiences and increased interest from television broadcasters and advertisers. Furthermore, GorTV, the broadcasting platform, will deliver Gor Mahia programming to several countries and territories around the country and in the region. Once the GorTV is launched, the club must plan to continue expanding the distribution of GorTV that must be supported by improving the quality of its content and its production capabilities. @oduor 12 and OJomondi, lets all register as members first and ask/post questions/comments later. ……………..My silver Membership number is 156671 for records. @Jakoyo, you are an Ingwe fan and why do you to register as a member of Gor Mahia? If the sentiments of Gor Mahia officials are to be taken seriously, then I can say that God is in deed Ebenezer. Yes Ebenezer because from their talk, it is evident that it is only through God’s grace that this club has overcome all manner of obstacles and adversities to continue standing on it’s feet and write chapter after chapter of footballing history. Listen to Ronald Ngala: “…..people who are not club members have no business demanding transparency”. …. He then says that transparency in ticket sales is not needed because fans can estimate gate collections by looking at how large the crowd is. If they care to listen or care to read and ponder then they ought to know that they are the ones to benefit hugely from the transparency fans are calling for. Transparency means more revenue through larger registered membership and higher match attendance. Higher revenue means larger sums of money to be corruptly pocketed. For this very simple and selfish reason, I will remind Ngala that Jesus said “Zakayo shuka”. I paraphrase this to Ngala shuka from where you are perched high up. Come down to the level of these fans, listen to them and you shall boost the amount of K’Ogalo money you will be lining your pocket with. Transparency means stability and less of industrial action from players. Stability provides opportunities for money to be eaten without anyone noticing. @Sylvester, there is nothing wrong with the government paying the ticket. We all need to think out if the box and take Gor Mahia forward than posting such retrogressive comments. We are all tax payers and there is thing wrong with government using part of my tax to pay for Gor Mahia tickets. @sylvester you are very right, indeed we are taxpayers whose money is used by the government to sometimes buy air tickets. So the arrogant Ngala should style up and stop displaying his ignorance. This site is full of kingdom gatekeepers! Listen to their hopeless defence of opacity. Yes we want to become members as early as yesterday but for this thieving mediocre ec together with thier cohorts, some who are very eloquent on this site. Let the 274 members blog here, and let the 274 members continue to attend gor matches!